I am always mindful to avoid looking like a restaurant waiter whenever I wear a vest, the same way I never wear a red shirt and khaki pants when I go to Target. For this particular outfit, I knew I wanted to wear this knit dress (another new Amour Vert find), and couldn't figure out what else to wear with it. My blazers were too long and made the skirt look a bit short, a sweater pulled over the dress sort of ruined the nice lines of the dress, and I didn't feel like wearing a cardigan. Vest to the rescue. 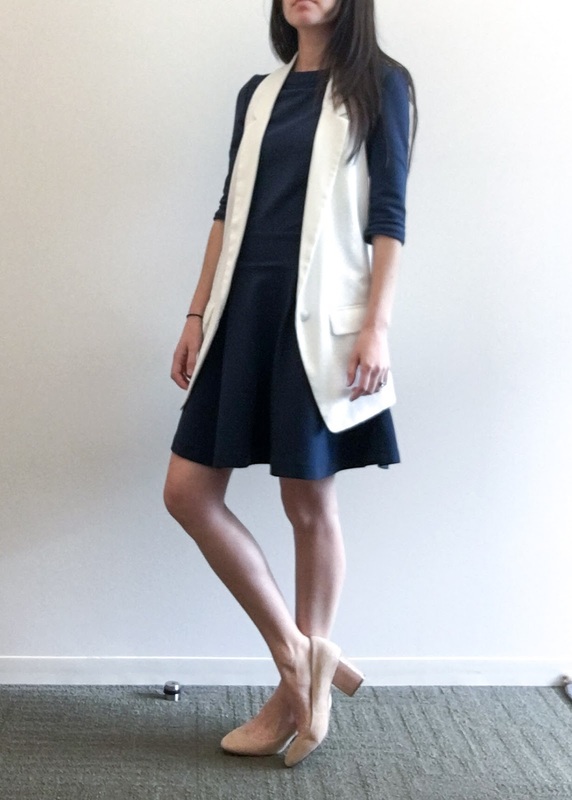 This vest shows off the long sleeves on the dress, the white provides a striking contrast to the navy, and, as the vest has pockets but the dress doesn't, it adds a level of functionality. 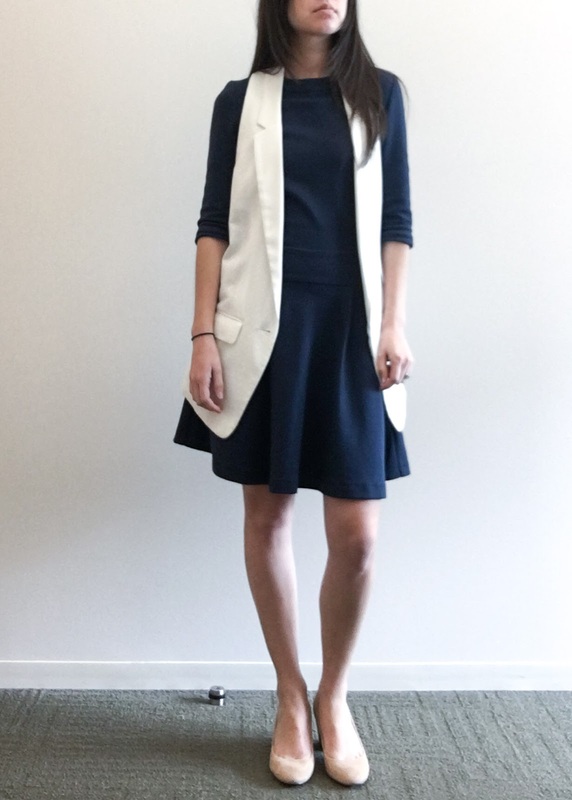 Also, since the vest has lapels, it invokes the style of a blazer in a way that still looks polished, for work. 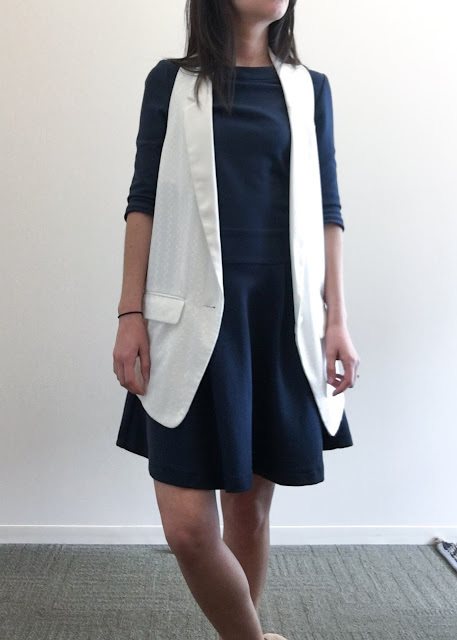 I don't wear this vest very often (I was actually surprised to see that I purchased it back in 2014) but it keeps surviving my closet clean-outs because when it does work, I really love it. 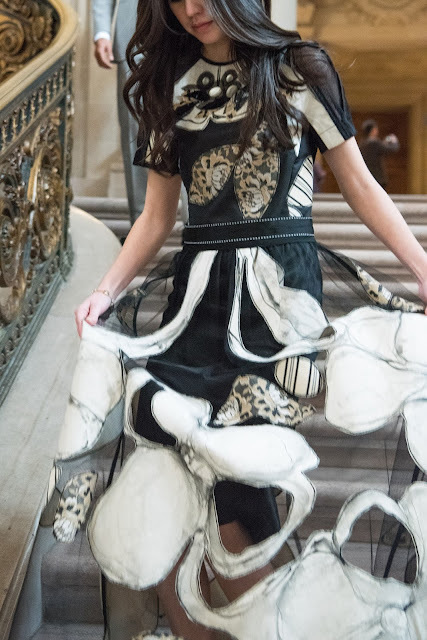 The dress by itself is also quite nice. It has a little keyhole in the back (covered by the vest) and the fabric is the perfect type of soft/stretchy fabric. It isn't too constricting, where you feel like your organs are being compressed all day, but also isn't too thin and shape-less. Have you invested in any vests?